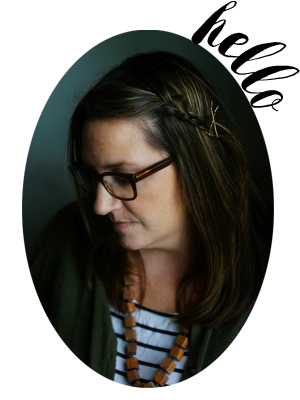 I am so excited to share this shop with you this afternoon–because as I sit here at my kitchen table writing this post, I'm wearing a little goodness around my neck from this very talented mother and artist. Erin of The Vintage Pearl, was one of my lovely sponsors for the month of August and she emailed me about working together on a Show & Tell for mommycoddle readers. How did you get started making jewelry? After my daughter was born (after having 2 boys) I started tinkering around with how to make jewelry for her and I to wear. I started with beading and soldering charms before discovering hand stamping. I love playing with new materials and figuring out new techniques! And I'm so happy to tell you that Erin is giving one lucky mommycoddle reader their choice of one item from her beautiful shop! Yup, that's right. Your choice of any item from The Vintage Pearl. You know how it works: Pop over to Erin's shop and have a look around. Come back and leave a comment letting us know what catches your eye, and you'll be entered in the giveaway. I will randomly choose and announce a winner on Monday. Good luck! And thank you, Erin for such a sweet giveaway! I am loving the the one with the birthstones or the 2 squares one, haven’t made my mind up yet. They are all beautiful though. Well, I looked and I really loved everything I saw – and I was amazed at the extremely reasonable prices. Have this bookmarked for gifts down the line. My favorite would be the flower and the circle charms- something I would love to wear. I love this jewelry so much. It just feels so sweet and timeless. I think gifts from here for my sister would be great! Thanks for the ideas. Oh, if I don’t win, this just might be what I ask for for Christmas!I think I would like the ‘square names’ for my 3 kiddos. Oh, gosh, there are so many beautiful things to choose from. The eclectic necklace is gorgeous, as is the circle of love bracelet. It would be hard to choose just one favorite! It’s all so sweet and lovely! The dainty drops necklace is super cute and colorful. Goodness– so hard to choose– but I think I would have to say the “our family nest” necklace is wonderful. I love all of her beautiful creations! I have my fingers crossed! This is a fantastic giveaway. Oh, they are all so lovely. I like the silver and pearl combination. I think the eclectic necklace is my favorite. They’re lovely. I liked the square names necklace the best, although it was hard to decide. There were so many pretty things. I love it all, especially the cup of love! Lovely things. Can’t pick just one! How about the dainty initial hearts? Or the Flower and circle necklace? Or the Eclectic necklace. Thanks for the chance to win! Oh… how do I choose? I love them all!I think if I were to win I’d choose the dainty names necklace (with my two boys’ names) or the family tree one. Lovely!I’ll be keeping all my fingers and toes crossed for this one! I love the square tag with cursive names and the heart attached. So sweet…all of them! Amazing jewelry. Each piece is so beautiful. My favorite is the Chunky Daisy Cuff Bracelet. i think that *mama bird* is just precious! it’s also what my teens call me! beautiful work. thanks for sharing the interview, and the give away chance! everything is so pretty, but the circle of love necklace was my favorite. thank you for sharing erin’s talent and creativity with us! Thanks for the link – it is earmarked as a favorite for me! I was immediately drawn to the mama bird pendant as I’ve been relating to the little red hen alot lately! This pendant really made an impression! I love the dainty layers – but it would be hard to choose just one, they are all so simple and beautiful. So many beautiful items! I really like the circle chain bracelet! All her necklaces are just beautiful! This has great potential for many future gifts! I love the dainty circles! What a great idea. I’m hopping over to her ‘shop’ to browse for Christmas ideas! what a lovely shop!so many wonderful items to choose from…my choice would be the hope circle chain bracelet.thanks for the chance to win one! I love how simple and beautiful her jewelry is. My favorite is the mama bird necklace. They are all very sweet, but my favorite is the “you are worth it all” layered necklace in the unique section and the “love you to the moon and back” in the simple section. tough choice. I love the mama bird necklace! oops, hope that comment with no text didn’t post. As we prepare to try for baby #2, I’m reflect on our journey to get #1. The “Large Layers” necklace saying “You are all worth it” took my breath away. Everything in Erin’s shop is so great. I love the idea of starting with one charm and being able to add as we have more babies. Truly lovely and I’ll be showing the hubby Erin’s site… Thanks, Molly! Oh my I love all of it! Dainty drops is my favorite, they are all lovely! ack! what lovely stuff! the dainty initial heart necklace just might be my favorite, though it would be hard to choose. i’d love to put not only my kids’ initials, but my husband’s too…thank you! I would have a hard time deciding between the family nest and the simple copper heart. All of them are simply charming! I love this jewelry so much! When I saw the necklace with the crescent moon that says “I love you to the moon and back”, I teared up a little! 🙂 It’s all so warm and special. It’s given me ideas for Christmas! I really like the bracelets, too. So great! Ooh, I love the family nest necklace! gorgeous work! I like the eclectic necklace! Oh my how beautiful! I love the dainty names necklace. Something to wear now and add to over the years as we finish our family. What a wonderful site! I haven’t worn anything on my wrist in a long time but I just love the Circle of Love bracelet. I think I would choose that if I win. But even if I don’t, I’ll be adding something from the Vintage Pearl to my christmas list, and grandma will be getting the keepsake key ring. Thanks for the chance to win! How perfect. How do you choose? I love the flower and the circle to bits and pieces. I cannot think of anything more timeless to wear around my neck. I am not huge costume jewelry wearer- but I can think of nothing better to wear everyday. I think that I may very well not take it off!! Thanks for sharing such a beautiful shop! Oh my… I am REALLY digging the momma bird!Those little pearls look like eggs! Sterling cuff or the rectangle charm. I love neat bracelets!!!! I love it all! It’s beautiful. But my favorite is the square charm with names and then the heart charm over the top. Adorable!!! I do so love this site. I especially love the single letter with the pearl. Very simple. very elegant. I LOVE mama bird and the sterling cuff! I have been dropping hints like crazy for my upcoming birthday. I love the family nest necklace. Oh, it’s so hard to choose! I think “Circle of Love”…but everything is so beautiful. The “you are worth it all” w/the baby feet brought tears to my eyes. How beautiful. I love the eternity heart I have thought about an an ‘ open heart’ necklace for some time because i tend to shut down sometimes and need to keep my heart open.. TYo have opne with my loved ones names on it would be wonderful! What beautiful jewelery! I would love to be entered in the giveaway! If chosen, I would like the vintage pearl dainty names necklace, with all 6 of my children’s names on it! Oh, actually this was an easy one as I love reading “Guess how much I love you” to my kids… And as Erin has that sweet moon shaped necklace with “I love you to the moon and back”, ah too perfect! I have bookmarked this site, the pieces are ALL lovely, but the chunky daisy cuff bracelet or the circle of love bracelet are my favorites. So many beautiful items to choose! This is definitely bookmarked for my holiday shopping… I really was touched by the “Cup of Love” necklace. I love the square tag with the names and the heart, but it was next to impossible to pick a favorite! LOVE the dainty drops!Would love to have one for me, my DH and my DD . . .
My friend is expecting her first baby this winter, and I’m going to save this site so I can get her something special when he/she arrives! I love them all. Would love to wear “a simple heart”. Thanks for the chance to win. I love the Hope necklace you feature, but also the a fused heart necklace- they are very beautiful! I love the simple necklace with just one charm (a circle) with a lower case initial and a pearl drop. After much deliberation I think my favourite is ‘I love you to the moon and back’. You sure are going to make someone very happy with this lovely giveaway. Good luck everyone!! Love the square names… What a great shop… I am wishing and hoping! I really like the keepsake baby spoon and also the square initial charms.. I had one of her lovely necklaces for my birthday last month, it’s just perfect with each of my 3 children’s initials. Everything is so simply elegant. I love the dainty drops. I could see wearing that every day. Thank you so much for the wonderful showcase and giveaway. something utterly simple…the square or the heart. I have loved Erin’s items for a while and my favorite thing was always the dainty names. I love them just as much but have to say that the dainty drops are giving it a run for it’s money! All of her jewelry is just darling and I would be delighted to wear any piece from her collection with pride. I don’t think I can pick a favorite, but I’ll say the Dainty Drops. Really, I love pretty much everything! Ohhh…I’ve been wanting one of these. I love the mother of pearl. Beautiful. I’ve been wanting a necklace to cherise my sweet little one with. I love the Mother of Pearl! I love the mama bird! Everything is so lovely, but love the flower and circle. So sweet and simple. They are all so cute and unique – love the hope bracelet I need to be reminded of hope,now. Ahh…..I was just looking at this shop yesterday. Mother of Pearl, definitely. Cross my fingers and toes…. Awww these are so cute and thoughtful!!! I loved the dainty drop necklace with the birthstones! What sweet little treasures! Gorgeous stuff. I love the mother of pearl necklace – simple and sweet. All of her designs are lovely. I would most likely love a pendant that says “breathe”. It would be a constant reminder to stop and take each day for what it is. I love the dainty hearts necklace (among others). How fun it would be to win! Thanks Molly. Square names with heart. Unique, yet simple. Love it. These are some of the best stamped jewelry I’ve seen-and very reasonable too. I like the mama bird and the family nest. Very sweet. I’ve been admiring her designs for quite a while going back and looking at my favorites. I really love the mamma bird with two pearls for my twins who I stay home with. And I’ve recently made choices not to work in the evenings because I was missing tucking them in at night. Great giveaway, love the dainty initial hearts. Just beautiful. I love the momma bird, it’s so simple and the pearls are the eggs, too cute!!! I’m thinking Christmas! Ahhh it has to be too early to think Christmas, but I guess not. Love them all! Can’t decide between the eclectic, mother of pearl and the rectangle design. Beautiful work! Thanks for the great giveaway!!! Wow! Beautiful. I like the circle chain link necklace that says hope. I love personalized items! I think these are so much nicer than birthstone rings and necklaces! 🙂 Love the flower and circle name necklace. I was amazed at the variety of designs. Erin is so creative! My favorites were the Family Nest and Names on my Heart. These are definitely great gift ideas. I love the names around my heart necklace! I’m a fan of Erin’s work and always recommend her. Thanks for the chance to win. Oh wow, what a fabulous shop!! Love ALL her designs…but the eclectic necklace and the family nest necklace both really speak to me. Great giveaway and I’m bookmarking this shop for christmas gifts!! love the names on a ring! if i had more than 2 kids, i would love the eclectic necklace too. Such lovely, lovely things! I love those birthstone necklaces. Wow what a generous offer. So many beautiful items… I would choose an item for my dear mother of seven children.